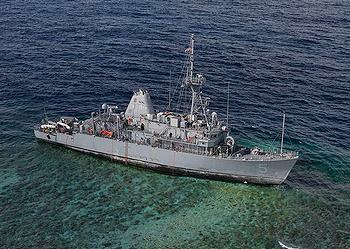 WASHINGTON, DC, January 25, 2013 (ENS) – All of the fuel onboard a U.S. Navy minesweeper grounded in the Philippines’ Tubbataha Reefs Natural Marine Park was removed today without a spill, but the incident has prompted calls for better protection of the pristine area. The 15,000 gallons of fuel carried by the USS Guardian was safely transferred to another vessel during two days of controlled de-fueling that began Thursday. Based at Sasebo, Nagasaki, Japan, the Guardian grounded early in the morning of January 17 in Tubbataha Reefs Natural Marine Park, a UNESCO World Heritage site in the Sulu Sea of the Philippines. Initial efforts to free the 68-meter long ship on high tide were not successful and the Guardian remains stuck on the reef 80 miles east-southeast of Palawan Island. The 80 crewmembers were evacuated safely; now there is no one onboard, and the Navy says there are “no traces of an oil slick in the area” although the vessel is taking on water. But conservationists warn that large areas of the pristine corals have been destroyed as the ship’s hull grinds on the reef, while monsoon winds are making it difficult to dislodge the vessel. “Hundreds of meters of once-pristine reef have already been flattened,” said the World Wide Fund for Nature Philippines. The Philippines government was promptly informed of the incident and is being updated regularly by U.S. officials. The U.S. 7th Fleet Commander expressed regret over the grounding. “As a protector of the sea and a sailor myself, I greatly regret any damage this incident has caused to the Tubbataha Reef,” said Vice Adm. Scott Swift. “We know the significance of the Tubbataha Reefs Natural Park and its importance as a World Heritage Site. Its protection is vital, and we take seriously our obligations to protect and preserve the maritime environment,” said Swift. When the Guardian is recovered by the U.S. Navy, Swift said the U.S. government will continue to work with the Philippines government to assess the extent of the damage to the reef and the surrounding marine environment caused by the grounding. There could have been even more fuel aboard the grounded vessel. Prior to leaving a port visit in Subic Bay, Guardian canceled a scheduled fuel stop to Puerto Princesa. 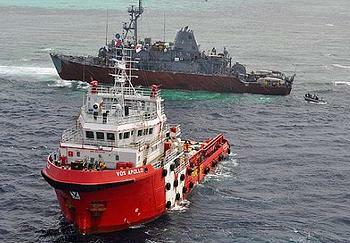 Guardian departed Olongapo City en route to Indonesia and was transiting the Sulu Sea when it ran up on the reef. The U.S. Navy is undertaking an investigation to determine the exact cause of the grounding. This investigation will include information on faulty digital navigation chart data that misplaced the location of Tubbataha Reef. On January 18, the U.S. National Geospatial-Intelligence Agency, NGA, provided the Navy with preliminary findings of a review on Digital Nautical Charts that contain inaccurate navigation data and may have been a factor in the Guardian grounding. Since Digital Nautical Chart mapping is used for safe navigation by other U.S. Navy ships, Navigator of the Navy Rear Adm. Jonathan White on Friday released precautionary guidance to all Fleet and ship commanders. White’s message states, “initial review of navigation data indicates an error in the location of Tubbataha Reef” on the digital map. NGA personnel have reviewed data from more than 150,000 square nautical miles in the surrounding area and found no additional errors. On October 31, 2005, the Greenpeace ship Rainbow Warrior ran aground on Tubbataha Reef, damaging some 1000 square feet of the reef, for which they paid a fine of about $7000. Greenpeace blamed the accident on inaccurate charts. WWF calls the reef “a food factory for the Sulu Sea” that continuously seeds the waters of Palawan and the West Visayan isles with fish and invertebrate spawn. Tubbataha hosts some 600 species of fish, 360 species of corals, 14 species of sharks, 12 species of dolphins and whales as well as nesting populations of seabirds and marine turtles. 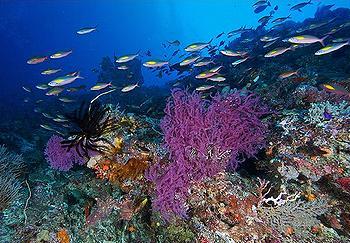 Tubbataha is a priority conservation area of WWF and is one of the Coral Triangle region’s most important marine areas. The conservation history of Tubbataha spans 25 years. It became the country’s first marine protected area in 1988 and a UNESCO World Heritage Site in 1993. In 2009, the Tubbataha Reefs Natural Park Act became law to provide more permanent management structures, fiscal autonomy, and steeper penalties for violating the rules of the park, which is under protective management by the Philippines Department of National Defense. WWF Philippines says several sanctions can be imposed on the ship for violating the Tubbataha Reef Natural Park Act: unauthorized entry, damages to the reef, destroying and disturbing resources and non-payment of conservation fees.